In this Podcast with Genia Stephen, we discuss How To Create The Good Life… Here is the secret…. it is to start with developing valued roles. What is a valued role? A valued role is the answer you give to the question ‘What do you do?’ when you meet someone new. [more on valued roles below] Genia also shares her story as a sibling, a mother to two sons, and how she has helped to create the good life for her son Will. 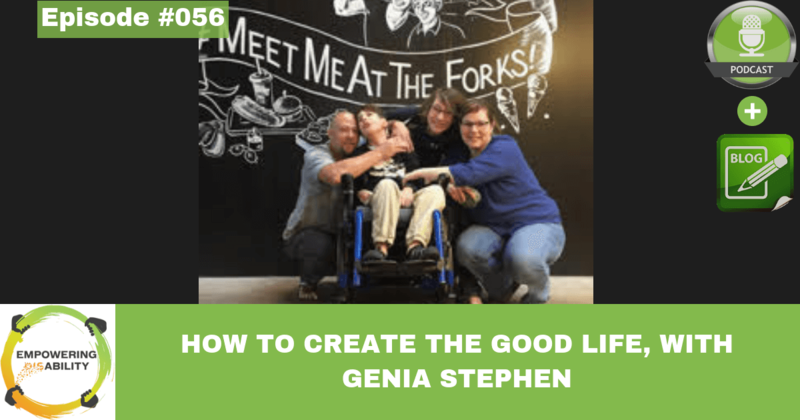 Professionally, Genia is a midwife to many, and an activist with a mission to band together with families to joyfully pursue the good things in life. She recently launched the Good Things in Life, which is an online community for young families who share a vision of the good life for their kids with disabilities. Genia is the 3rd of 4 daughters, and her younger sister Kate has a DD. Genia’s two older sisters are a fair amount older, and it was really just the two of them (Kate & Genia) when they were growing up. Genia remembers going to appointments with Kate where they had Kate do silly things, like hold onto the pencil, and they would pull on it until she let it go. Kate didn’t care much for holding onto the pencil and as a result, was diagnosed with having poor muscle tone. But, Genia and Kate thought it was funny because Kate would drag Genia around the house on her back by her toes. It was a big deal for Genia’s mom. She had never experienced someone with a disability, Her mom was terrified, intimidated, and overwhelmed. It was something worth crying about for her. Genia’s mom reached out and started to connect with other parents and other people that knew more than she did. She surrounded herself with this community and exploded into a powerful advocate. She stopped delivering the information in a way that elicited sadness and started having really high expectations. She had connected with some people that had worked with Dr. Wolf Wolfensberger, who developed the social theory of Social Role Valorization (SRV). Genia attended her first SRV workshop at 15. It taught her language, and how the world works for people that are devalued. Key Insight: Connecting with other families is important. Not just getting connected, but who you get connected with. What are their beliefs and mindsets? How you deal with grief and fear is guided by your mindsets and fear for a person with a disability. What is Social Role Valorization (SRV)? GS: “If your major fear is that someone is going to be hurt or rejected, and the way that you prevent that is by keeping people protected and isolated from the people that might hurt them, then that leads you down a vision that likely includes a lot of services and people paid to keep the person safe. Alternatively, if your mindsets and beliefs are that safety for vulnerable people comes through relationships, this leads you down a path of life in the community. What Does The Good Life Look Like for Will? Listen to the podcast to hear how Genia’s family has thought about the role of student for Will. Genia and her family thought through the things that were likely to increase people’s high expectation and positive image of Will in the role of student, starting from the age of 2! Want proof!?! Watch the video below. Key Insight: Look to what is typical for people that don’t have a disability at that stage of life and focus on the roles the individual could hold to create your vision. Additionally, the person supporting needs to understand the social role and also have the social currency to help them get there. The Good Things in Life –> For Parents of young children with IDDs. Goodthingsinlife.org.